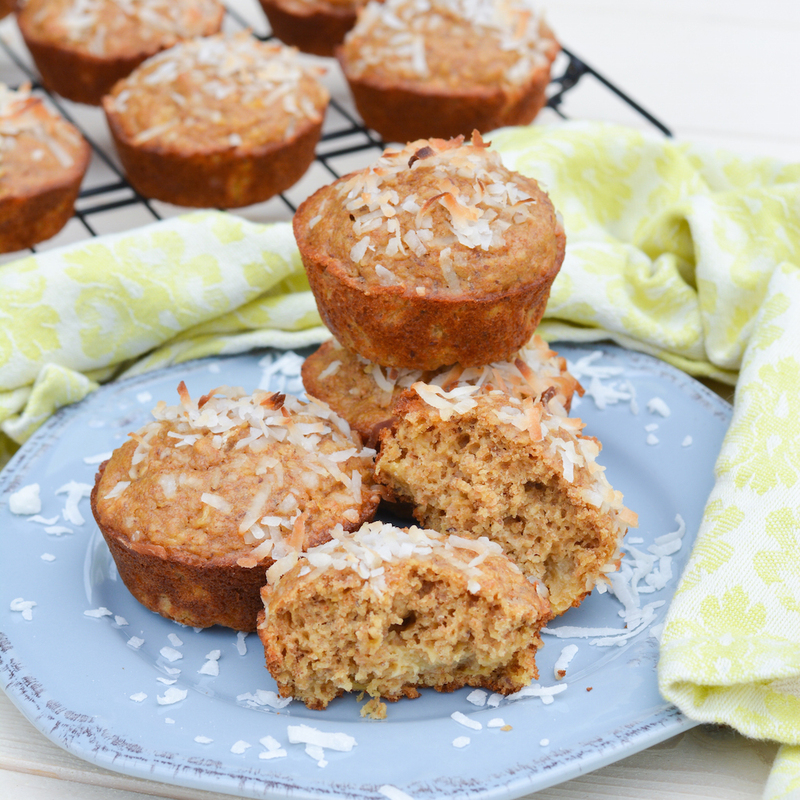 These Piña Colada Oatmeal Muffins are packed with healthy oatmeal and whole wheat, and lightly sweetened with coconut sugar and pineapple juice. They’re super easy too, made completely in the food processor or blender! Well, here we are. Two days past baby girl’s due date… and still no baby. And no sign that she’s planning on making her grand entrance any time soon. Boooo. Though I am a little terrified of actually getting her out, we are definitely ready to meet her! I hadn’t planned on doing anything these past couple days, and so I’ve been a little bored. And what is there to do when you’re home alone and bored besides bake!? I loved how easy these Strawberry Banana Oatmeal Flax Muffins were to make in the food processor, so I decided to try another version of muffin in the same way. Unlike those, which use all oatmeal, I added a little whole wheat flour to this batch to make it a little fluffier and more like a typical muffin. I didn’t have any ripe bananas, so instead I went with the only fruit I had in the house– canned pineapple! It’s perfect for sweetening the muffins and giving them just a bit of texture. Plus, pineapple is supposed to induce labor, right? Here’s to hoping! I added some flax seed since I’ve been adding it to everything lately (it’s great for baby and breast feeding, but also super healthy for everyone in general!). The coconut part of the pina colada mainly comes from coconut sugar and coconut butter, which both give just a subtle sweetness and flavor, but I also sprinkled some shredded coconut on top for fun. 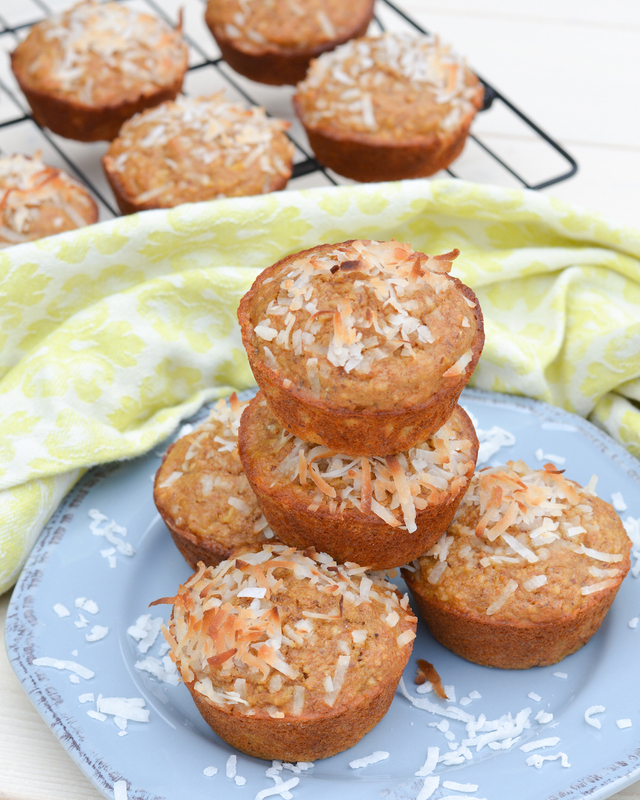 These Piña Colada Oatmeal Muffins are packed with healthy oatmeal and whole wheat, and lightly sweetened with coconut sugar and pineapple juice. They're super easy too, made completely in the food processor or blender! Preheat oven to 375 degrees. Spray a 12-cup muffin tin with nonstick spray and set aside. Place oatmeal in a food processor (or heavy duty blender) and process until it's the consistency of a slightly chunky flour. Add whole wheat flour, flax seed, baking powder, soda, salt and sugar to the food processor and pulse a few times to combine. Add the eggs, pineapple juice, vanilla and coconut butter. Process until smooth. Add the pineapple chunks and pulse a few times to just barely break up the pineapple. Divide the batter evenly among 12 muffin cups. Sprinkle tops with shredded coconut. Bake 20-25 minutes, until edges are golden and a toothpick inserted comes out clean. Cool a few minutes in the muffin tin, then transfer muffins to a wire rack. As with most muffins, these freeze really well. Just microwave them for about 30 seconds to defrost. Perfect for making ahead and grabbing them when you’re busy (like with a newborn!). Hopefully baby girl will be here soon. Have a great week! 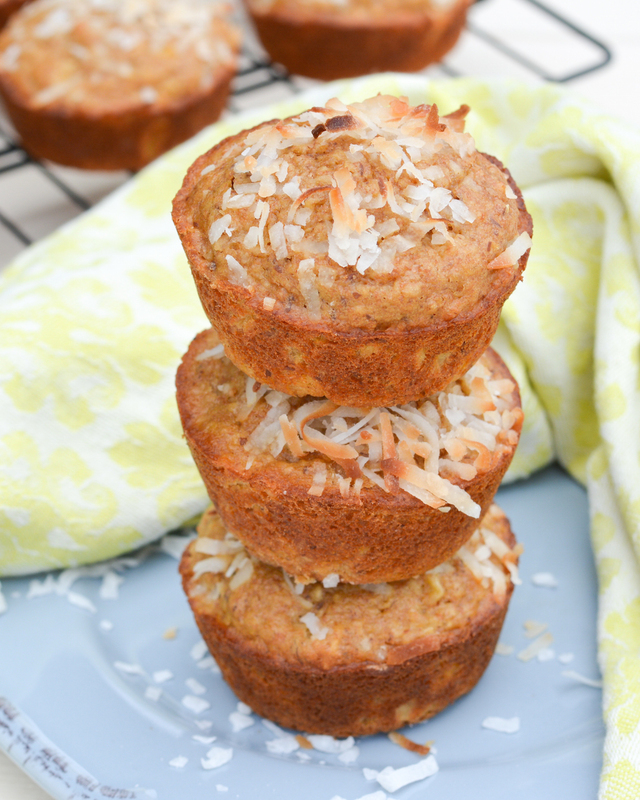 Check out these other delish muffin recipes! Aww, I hope for your sake that she decides to come soon!! Just eat some spicy food and bounce on a ball, lol! Or just relax and eat some of these delicious looking muffins! 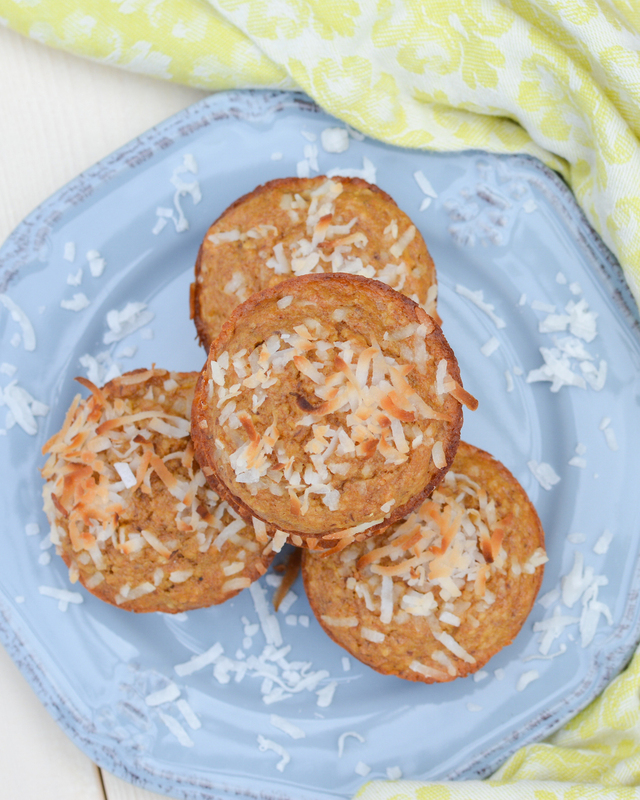 I love having muffins around to snack on and even more so when they are fun flavors like this! Baking is the best thing to do when you’re bored! I hope she makes her arrival soon, though. Luckily, you have these muffins to keep you company. They look delicious, Jess! I always bake when I’m bored. And then I have to freeze some of it because I cannot eat it that fast! These look great. I’d have a hard time having just one. For the oatmeal ingredient, do you actually prepare the oatmeal of just use the oats? Thanks for the recipe – planning to make these this weekend! Hi Lincoln! Just use the oats straight from the package!